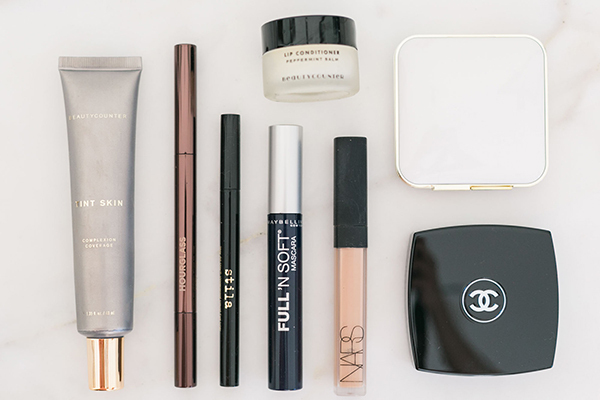 We all have mornings where we’re strapped for time yet still need to look presentable. Trust me when I say I’ve been there! Your alarm clock doesn’t go off, you’ve pressed snooze one too many times, or your morning just isn’t going quite going way you want it to. With a busy schedule and hardly enough time to make breakfast, putting on a full face of makeup doesn’t always make sense. On busy mornings I opt for lighter but even-looking coverage when it comes to foundation. I want my skin to have a healthy, even glow without going over the top. For this I use BeautyCounter’s Tint Skin Foundation. I love how blendable their foundation is and the end result feels completely weightless. Once my foundation is evenly applied, I reach for my NARS Radiant Creamy Concealer. I like to cover any noticeable redness or dark circles under my eyes, but make sure to do the bare minimum. Remember, we’re trying to save as much time as possible. Save any major contouring for another day! Don’t forget to leave the house with a pretty, natural flush. I like to lightly contour my cheeks by applying Tom Ford’s Bronzing Powder in Gold Dust. I rarely contour my entire face so just a touch of bronzing powder does the trick. I then apply Chanel Joues Contraste Powder Blush in Malice to the apples of my cheeks. It adds enough color to give me a healthy glow without being over the top. Believe it or not there are only three products that I use on my eyes on a regular basis—whether I’m trying to save time or not! First I start by sculpting my brows. I’m more of a natural girl myself, especially in the brow department. I use the Arch Brow Sculpting Pencil by Hourglass to make my brows look defined and a bit fuller. I pencil in my eyebrows mimicking the natural direction of the hair and use the spooli on the other end to blend it all out. Next, I go in with my Stila’s Stay All Day Waterproof Eyeliner. This liner dries quickly, doesn’t easily smudge, and the thin tip makes the perfect wing. With enough practice, I can now apply perfect winged eyeliner in less than a minute. Once I’m done putting on eyeliner, I coat my eyelashes with Maybelline’s Full & Soft Mascara and call it good! While there’s nothing I love more than a classic red lip, a 5-minute makeup routine calls for something simpler. Before I head out the door I swipe on BeautyCounter’s Lip Conditioner Peppermint Balm for moisture. Made with all-natural ingredients, it leaves my lips extra soft. Plus I love how refreshing the peppermint feels! And there you have it! With enough practice you’ll have this routine down in five minutes flat. How do you save time in the morning? I’d love to hear your tips in the comments! P.S. 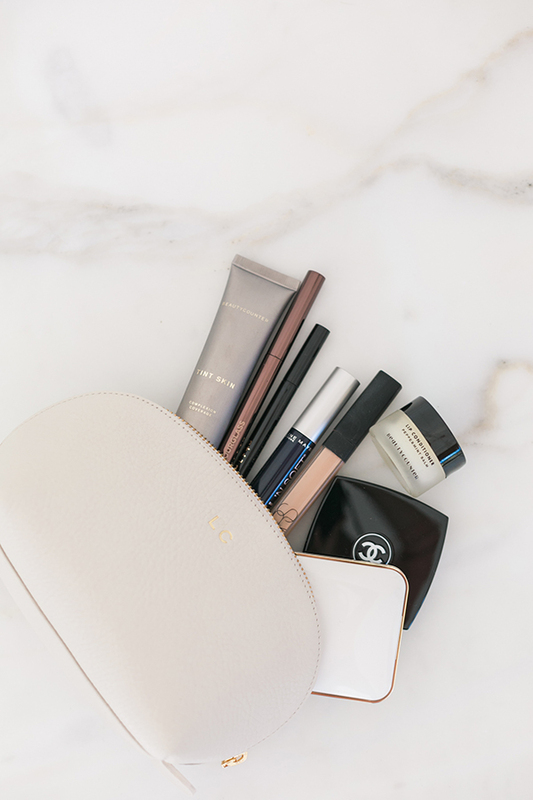 My cute monogrammed makeup bag is this one from Cuyana.